Goa is one exclusive place where people have the oppurtunity to spend some quality beach time in tents. We at Shawnel Beach Resort have on offer “beach tents” just a few footsteps away from the Palolem beach that they are located in. The true experience of living out in the open is in one of the simple or deluxe tents on the beach. Experience Goan life, up close by soaking in the smells, taste and oneness of being together with nature upclose and personal. The private beach tents on Palolem Beach are the ideal Goa holiday packages for guests who wish to hear the crash of tides during their solitary moments. Out on the porch, the guests can enjoy an unobstructed view of the Arabian Sea. Our tents that are used at Shawnel Beach Resort are made of quality grade Canvas in a style that reflects the high class luxurious living of the ancient Rajasthani kings. Beach Tents of this style and character were used by the ancient kings, when they travelled anywhere out of state or on hunting trips deep into the jungles of India. Each tent has a living space of 16 square meters with traditional dhuri carpets on the floor, each comfortably accommodates twin beds, which can be set up as a double. Our range of beach tents at Shawnel Beach Resort have the lines of elegant natural aesthetic, which allows them to naturally blend with the environment and are eco-friendly. With unique, stylish designs and shapes, and with the use of finest quality materials, our beach tents are not only attractive but very unique, exclusive and unusual. Welcome to the world of Beach Tenting in our down to the earth yet soul satisfying experience of living in one of our personal beach tents on Palolem beach at Shanwel Beach Resort. All our beach tents at Palolem are totally self contained, self sufficient and self cooling with the comfortable air conditioning on. 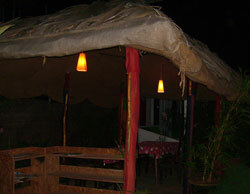 Welcome to live in natural tents on the beach besides the Arabian Sea on your favorite and most popular beach of Goa. Welcome to Tenting in Goa.